A careful, pedestrian writer...interested not only in the grandiose or the exquisite but in unusual sights and obscure ritual. He is occasionally careless or makes unwarranted inferences, and his guides or even his own notes sometimes mislead him, yet his honesty is unquestionable, and his value without par. 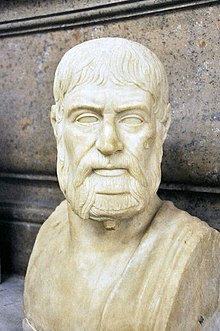 Pausanias was born in 110 AD into a Greek family  and was probably a native of Lydia; he was certainly familiar with the western coast of Asia Minor, but his travels extended far beyond the limits of Ionia. Before visiting Greece, he had been to Antioch, Joppa, and Jerusalem, and to the banks of the River Jordan. In Egypt, he had seen the pyramids. While at the temple of Ammon, he had been shown the hymn once sent to that shrine by Pindar. In Macedonia, he appears to have seen the tomb said to be that of Orpheus in Libethra (modern Leivithra). Crossing over to Italy, he had seen something of the cities of Campania and of the wonders of Rome. He was one of the first known to write of seeing the ruins of Troy, Alexandria Troas, and Mycenae. Pausanias' Description of Greece is in ten books, each dedicated to some portion of Greece. He begins his tour in Attica (Ἀττικά), where the city of Athens and its demes dominate the discussion. Subsequent books describe Corinthia (Κορινθιακά) (second book), Laconia (Λακωνικά) (third), Messenia (Μεσσηνιακά) (fourth), Elis (Ἠλιακῶν) (fifth and sixth), Achaea (Ἀχαικά) (seventh), Arcadia (Ἀρκαδικά) (eighth), Boetia (��οιωτικά) (ninth), Phocis (Φωκικά) and Ozolian Locris (Λοκρῶν Ὀζόλων) (tenth). The project is more than topographical; it is a cultural geography. Pausanias digresses from the description of architectural and artistic objects to review the mythological and historical underpinnings of the society that produced them. As a Greek writing under the auspices of the Roman empire, he was in an awkward cultural space, between the glories of the Greek past he was so keen to describe and the realities of a Greece beholden to Rome as a dominating imperial force. His work bears the marks of his attempt to navigate that space and establish an identity for Roman Greece. He is not a naturalist by any means, although from time to time, he does comment on the physical realities of the Greek landscape. He notices the pine trees on the sandy coast of Elis, the deer and the wild boars in the oak woods of Phelloe, and the crows amid the giant oak trees of Alalcomenae. 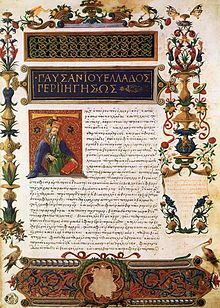 It is mainly in the last section that Pausanias touches on the products of nature, such as the wild strawberries of Helicon, the date palms of Aulis, and the olive oil of Tithorea, as well as the tortoises of Arcadia and the "white blackbirds" of Cyllene. Pausanias is most at home in describing the religious art and architecture of Olympia and of Delphi. Yet, even in the most secluded regions of Greece, he is fascinated by all kinds of depictions of deities, holy relics, and many other sacred and mysterious objects. At Thebes he views the shields of those who died at the Battle of Leuctra, the ruins of the house of Pindar, and the statues of Hesiod, Arion, Thamyris, and Orpheus in the grove of the Muses on Helicon, as well as the portraits of Corinna at Tanagra and of Polybius in the cities of Arcadia. In general, he prefers the old to the new, the sacred to the profane; there is much more about classical than about contemporary Greek art, more about temples, altars and images of the gods, than about public buildings and statues of politicians. Some magnificent and dominating structures, such as the Stoa of King Attalus in the Athenian Agora (rebuilt by Homer Thompson) or the Exedra of Herodes Atticus at Olympia are not even mentioned. Unlike a Baedeker guide, in Periegesis Pausanias stops for a brief excursus on a point of ancient ritual or to tell an apposite myth, in a genre that would not become popular again until the early nineteenth century. In the topographical part of his work, Pausanias is fond of digressions on the wonders of nature, the signs that herald the approach of an earthquake, the phenomena of the tides, the ice-bound seas of the north, and the noonday sun that at the summer solstice, casts no shadow at Syene (Aswan). While he never doubts the existence of the deities and heroes, he sometimes criticizes the myths and legends relating to them. His descriptions of monuments of art are plain and unadorned. They bear the impression of reality, and their accuracy is confirmed by the extant remains. He is perfectly frank in his confessions of ignorance. When he quotes a book at second hand he takes pains to say so. The work left faint traces in the known Greek corpus. "It was not read", Habicht relates; "there is not a single mention of the author, not a single quotation from it, not a whisper before Stephanus Byzantius in the sixth century, and only two or three references to it throughout the Middle Ages." The only manuscripts of Pausanias are three fifteenth-century copies, full of errors and lacunae, which all appear to depend on a single manuscript that survived to be copied. Niccolò Niccoli had this archetype in Florence in 1418. At his death in 1437, it went to the library of San Marco, Florence, then it disappeared after 1500. Until twentieth-century archaeologists concluded that Pausanias was a reliable guide to the sites they were excavating, Pausanias was largely dismissed by nineteenth- and early twentieth-century classicists of a purely literary bent: they tended to follow the usually authoritative Wilamowitz in regarding him as little more than a purveyor of second-hand accounts, who, it was suggested, had not visited most of the places he described. Habicht (1985) describes an episode in which Wilamowitz was led astray by his misreading of Pausanias in front of an august party of travellers in 1873, and attributes to it Wilamowitz's lifelong antipathy and distrust of Pausanias. Modern archaeological research, however, has tended to vindicate Pausanias. ^ Also known in Latin as Graecae descriptio; see Pereira, Maria Helena Rocha (ed. ), Graecae descriptio, B. G. Teubner, 1829. ^ One Hundred Greek Sculptors: Their Careers and Extant Works, introduction. ^ Howard, Michael C (2012). Transnationalism in Ancient and Medieval Societies: The Role of Cross-Border Trade and Travel. McFarland. p. 178. ISBN 9780786490332. Pausanias was a 2nd century ethnic Greek geographer who wrote a description of Greece that is often described as being the world’s first travel guide. ^ Pausanias, Description of Greece: Boeotia, 9.30.7: "Going from Dium along the road to the mountain, and advancing twenty stades, you come to a pillar on the right surmounted by a stone urn, which according to the natives contains the bones of Orpheus." ^ Christian Habicht, "An Ancient Baedeker and His Critics: Pausanias' 'Guide to Greece'" Proceedings of the American Philosophical Society 129.2 (June 1985:220–224) p. 220. ^ Aubrey Diller, "The Manuscripts of Pausanias The Manuscripts of Pausanias" Transactions and Proceedings of the American Philological Association 88 (1957):169–188. ^ In this, Heinrich Schliemann was a maverick and forerunner: a close reading of Pausanias guided him to the royal tombs at Mycenae. "The Oldest Guide-Book in the World", Charles Whibley in Macmillan's Magazine, Vol. LXXVII, Nov. 1897 to Apr. 1898, pp. 415–421. This article incorporates text from a publication now in the public domain: Chisholm, Hugh, ed. (1911). "Pausanias (traveller)" . Encyclopædia Britannica. 20 (11th ed.). Cambridge University Press. G. Hawes, Rationalizing myth in antiquity. Oxford: OUP, 2013 ISBN 9780199672776 contains much discussion of Pausanias’ sceptical approaches to myth. Arafat, K.W. 1992. "Pausanias' Attitude to Antiquities." Annual of the British School at Athens 87: 387-409. Akujärvi, J. 2005. Researcher, Traveller, Narrator: Studies in Pausanias’ Periegesis. Studia graeca et latina lundensia 12. Stockholm: Almqvist & Wiksell. Alcock, S., J. Cherry, and J. Elsner, eds. 2001. Pausanias: Travel and Memory in Roman Greece. Oxford: Oxford Univ. Press. Arafat, K. 1996. Pausanias’ Greece: Ancient Artists and Roman Rulers. Cambridge, UK: Cambridge Univ. Press. Diller, A. 1957. "The Manuscripts of Pausanias." Transactions of the American Philological Association 88:169–188. Habicht, C. 1984. "Pausanias and the Evidence of Inscriptions." Classical Antiquity 3:40–56. Habicht, C. 1998. Pausanias’ Guide to Ancient Greece. 2d ed. Sather Classical Lectures 50. Berkeley: Univ. of California Press. Hutton, W. E. 2005. Describing Greece: Landscape and Literature in the Periegesis of Pausanias. Greek Culture in the Roman World. Cambridge, UK: Cambridge Univ. Press. Pirenne-Delforge, V. 2008. Retour à la Source: Pausanias et la Religion Grecque. Kernos Supplément 20. Liège, Belgium: Centre International d‘Étude de la Religion Grecque. Pretzler, Maria. 2005. "Pausanias and Oral Tradition." Classical Quarterly 55.1: 235-249. Pretzler, M. 2007. Pausanias: Travel Writing in Ancient Greece. Classical Literature and Society. London: Duckworth. Pretzler, Maria. 2004, "Turning Travel into Text: Pausanias at Work" Greece & Rome 51.2: 199–216. Sanchez Hernandez, Juan Pablo. 2016. "Pausanias and Rome's Eastern Trade." Mnemosyne 69.6: 955-977. New translation by Gregory Nagy of Harvard University's Center for Hellenic Studies (incomplete).